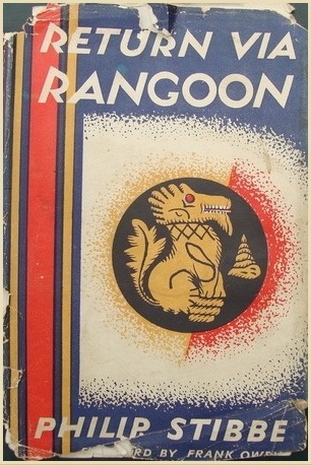 Stibbe's dedication in 'Return via Rangoon'. On the 28th March 1943, 5 Column reluctantly entered the village of Hintha having found no penetrable way around the small settlement, on their journey west towards the Irrawaddy River. It was in this village that Fergusson's men met their own personal 'Waterloo' and a ferocious battle with the Japanese ensued. 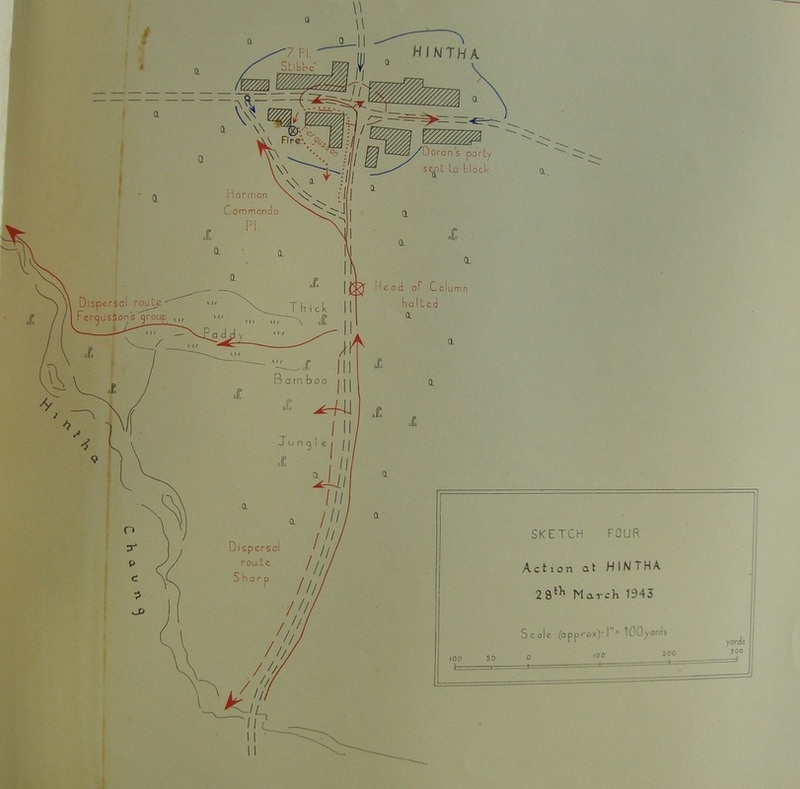 As a consequence of this engagement, Lieutenant Philip Stibbe was wounded and subsequently found marching and other movement extremely difficult. The young subaltern realised that he was now holding up his unit as it marched away from the village and asked to be left behind at some suitable spot to rest and hopefully regain some strength. At first his Chindit comrades would have none of this, but eventually it became only too obvious that he could no longer continue and arrangements were then made for him to be left behind. Philippe had lost a great deal of blood by the time the dispersal was sounded, and had to be mounted on a pony. Bill Aird had had time to dress both his wounds; the second one looked as if it might be in the kidneys. To start with he had been with a party which had no other animals with it, and which was in a bad bit of country. Realising that he was slowing up the party, he had begged to be left behind. Those with him indignantly refused; but when, after another half-mile, his pony had been responsible for several more delays, he slipped from the saddle to the ground, and said, "Now you've jolly well got to leave me." Nor does his story end there; for a Burma Rifleman, unwounded, cheerfully said he would stay with Philippe and look after him; and in spite of Philippe's vehement orders to the contrary, he did so. We believe that this was Rifleman Maung Tun, but have not been able to establish his identity beyond doubt. 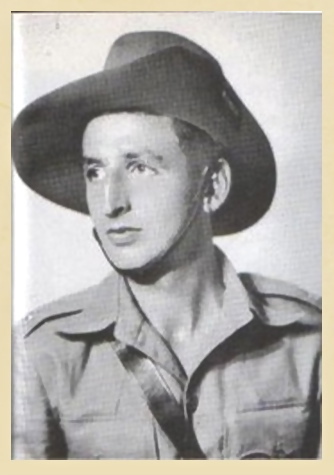 The Burrifs had always had a great affection for Philippe, and this noble story, with its double heroism, is the highest manifestation I have known of the comradeship between the British and Burman soldier. 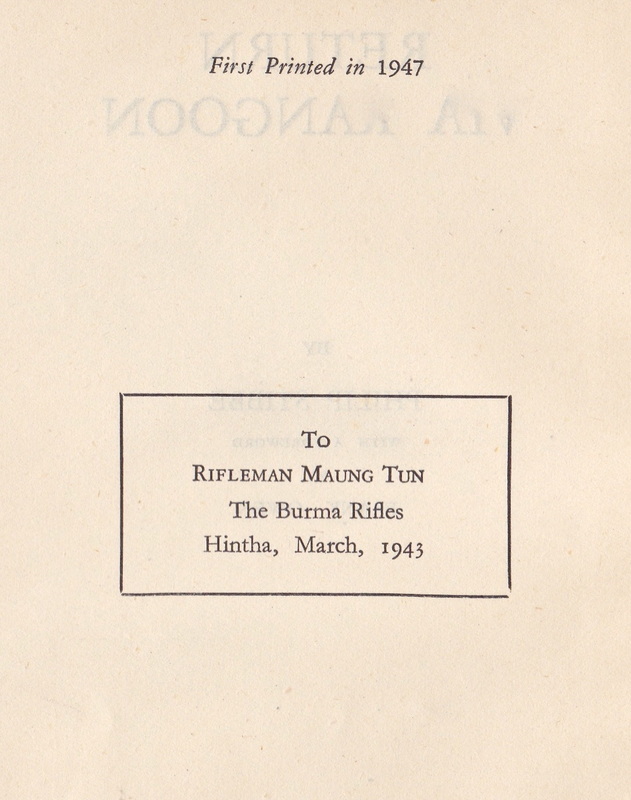 The Burrif who volunteered to stay behind with me was Rifleman Maung Tun. I had not previously known his name and, when he told me what it was, it sounded more like "Moto" that anything else, so Moto he became. I learnt from him that his home was in the Bassein district; he was not as tall as most of the Karens and he had cropped hair and a very friendly grin. When Bill Williamson and his party had disappeared round the bend in the track, he led me to a sheltered spot in the jungle and in a short while he had made a bed on the ground with blankets and ground sheets and spread another ground sheet above it on poles to keep off the rain. I never had to tell Moto anything or ask him for anything. He looked after me that day as carefully and gently and anxiously as a mother looks after a sick child. Although my wound did not hurt me while I lay still, every movement was painful; I also found that when I lay on my left side the blood seemed to collect there, so every time my heart beat there was a squelching sound like a small sponge being squeezed out. Intriguing though this was, I did not lie on that side for long. Every time I had to get up or lie down Moto assisted and supported me; he even helped me to eat and drink. Without my suggesting it, he boiled some salt water and then bathed my wound as though he had worked in a hospital all his life. Although Moto did not speak much English, we understood one another fairly well and I tried to make him realise how grateful I was. I told him that I thought if we could find food and water I would soon be well enough to move on. The only map we had was a map of the whole of Burma on a silk handkerchief and, with the aid of this, we examined possible routes back to India. He seemed as optimistic about it as I was, but he seemed anxious that I should sleep; this seemed a good idea to me to, so I took a couple of morphia pills and for the next few hours I knew nothing. When I woke up it was evening and already beginning to get dark. There was no sign of Moto anywhere but he had said something about going to look for food so I was not unduly worried. As it grew dark I heard a lot of rustling in the leaves near where I lay and, to my horror, I saw (or perhaps I only imagined I saw) several large spiders crawling towards me. They seemed to be about the size of my hand and I thought they must be attracted by the smell of blood. I managed to keep them away by throwing things at them but each time I frightened them off I heard them rustling towards me again. At last, just before it was dark, I heard a whistle; I answered this eagerly and moments later Moto appeared. He had put on his longyi and returned in the direction of Hintha. One of the villagers had told him that the Japs were still there but he seemed to think they would be going soon. He said that when they had gone Moto could take me into the village and they would be glad to put me up in one of their houses and look after me. Meanwhile, he promised to meet Moto at a certain spot the following morning and give him food and the latest news of the Japs. This sounded very encouraging. We talked things over for a little while, had a few biscuits and some tea, and before long I was asleep again. The following morning I felt much better. Moto bathed my wound and, about ten o'clock, he set off to meet the villager as arranged. Before going he asked me if I was sure I would be all right, and then, saying he would soon be back, he strode off. I remember watching him go; he was wearing his brightly coloured longyi and a khaki shirt, and he had slung his Tommy gun over his shoulder. It was difficult to masquerade as a peaceful Burman civilian with a Tommy gun but no doubt he meant to hide it somewhere if he met anyone. I shouted after him to be careful and he turned his head and grinned. All that day I waited for him to return, inventing countless reasons for his prolonged absence in an effort to avoid my worst fears. Perhaps the Japs had gone and he was preparing a house for me in the village; perhaps he had failed to find anything at Hintha and was trying another village further afield; or perhaps he had lost his way coming back. He still had not returned when I finally went to sleep that night; the following morning when I awoke I hoped against hope to find that he had returned during the night, but I was still alone. At ten o'clock, when he had been gone twenty-four hours, I decided to wait for him another day and, if he still had not returned, I would have to try to reach Hintha myself. I now had no food left except the tin of corned beef, and the water had almost run out. Fortunately the bathing seemed to have done my wound good and Moto had fixed a dressing on it very securely. If this dressing had slipped I could not have replaced it myself. The hours dragged by and, as if to torment me further, a bird kept on whistling the recognition signal I had arranged with Moto, so that I was repeatedly sitting up and answering it. 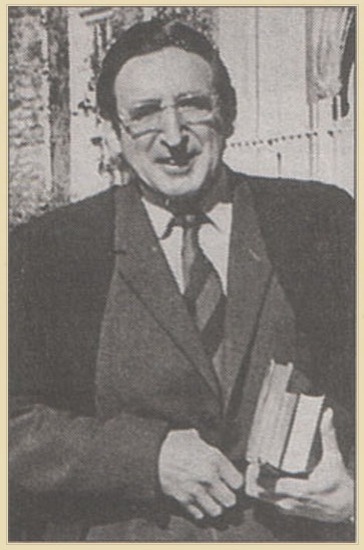 Pausing from Stibbe's account for a moment; seen below are two images in relation to this story. 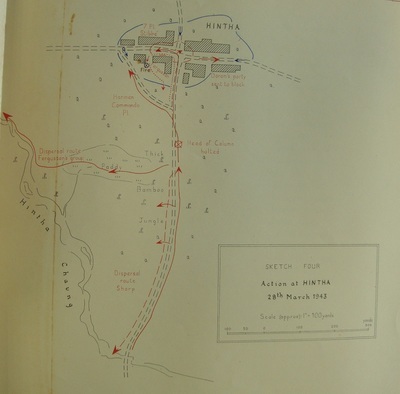 Firstly, a sketch map of the village of Hintha, showing the positions of the various Chindit platoons and then a photograph of the young Lieutenant himself. Please click on either image to bring it forward on the page. Even after I had realised that it was only a bird and not Moto who was whistling, I felt bound to answer every time in case Moto did come; I could not risk the possibility of his coming and being unable to find me because I did not answer his whistle. In the evening I was attacked by swarms of mosquitoes the moment I put any part of my body out from under the blanket. Somehow or other I did not feel despondent; instead I was filled with a desperate recklessness, no longer caring very much what happened. In this mood, I opened the tin of bully beef, ate it and felt much better for it, finished all the water and went to sleep. The next morning, the 31st March, there was still no sign of Moto, but I was loath to give up hope completely and decided to wait for a few more hours. By this time I had a raging thirst; Moto had told me that there was some water quite near so I set out to look for it. My own shirt was still soaked with blood but my slacks were not quite so bad and I pulled them on with considerable difficulty as my wound prevented me from using my left arm. Moto had left behind a blue flannel shirt and it took me about quarter of an hour to struggle into it. In my pocket I still had a grenade but I had somehow lost my revolver at Hintha; my hat had gone too so I put on the one Moto had left. Then, water bottle in one hand and compass in the other, I set out. I was still very weak and had to keep stopping for a rest. After wandering about in the jungle for about an hour without finding water I was exhausted. I had tried to keep a check on my position with my compass but, to my dismay, when I tried to find my way back to the bivouac, I discovered I was completely lost. I searched for some time but only became more tired, thirsty and, apparently, hopelessly lost; the only recognisable feature was a hill which I knew was not far from Hintha and I decided I must make for it. Progress was slow and I had to stop for a rest even more frequently, but at length I came upon a track and found a few mules that had been left behind by the column; some were already dead, and some still had their loads on their backs. I decided I was not in a fit state to unload them. I followed the track in the direction of the village and suddenly saw a pool of filthy-looking water; without hesitation I drank my fill of it and replenished my bottle before going on. Once again I found myself approaching the village by the same route as the column had used three days before and once again I knew that the jungle and thorns were so thick that there was no way off the track; I had not intended to approach the village so blatantly but there seemed no alternative. Sooner or later, I felt, I was bound to go into the village for food. I reached the point before the first houses, where the little track branched off to the left and where the Commandos has put in their attack; it seemed better to turn down there rather than walk to the "T" junction. I rounded the corner and a few yards ahead of me I saw three or four men sitting in shadow under a tree. For a few seconds we stared at each other. Then they sprang up and, as they ran into the light, I saw that they were Japs. I struggled for a while but it was useless and very painful. They tied my hands and tried to make me kneel and submit to them formally; I refused and, after a time they gave up the idea and, having taken my watch, they led me off through the village. As we passed the "T" junction, I suddenly had an idea that Moto might be somewhere near and managed to shout out, "Moto, Moto, they have caught me" at the top of my voice before they shut my mouth. Moto could not hear. Later from other prisoners I learned what had happened. Somehow the Japs had discovered where he was to meet the villager and, when he arrived at the spot, they were waiting for him. They also knew that he was looking after a British officer somewhere in the jungle but, when they asked him where I was, he would not speak. They tried to make him speak by beating him and all manner of torture but still he would not tell them; finally they realised that nothing would break his spirit so they shot him. I cannot put into words what I feel about this man. His utter unselfishness in volunteering to stay behind with me, his devotion in looking after me so well and, finally, his matchless courage in facing torment and death rather than betray me to the enemy, these are things I cannot trust myself to speak of even today. I can never be worthy of the sacrifice he made but, as long as I live, I shall always have the feeling that my life is not my own, and the memory of Maung Tun will inspire me to the end of my days. This is a story of great self-sacrifice and devotion to duty, performed by a man who was fighting for the freedom of his country, but who was able to form an understanding with his British comrades, based on mutual trust and strong enough for him to lay down his life in protecting. 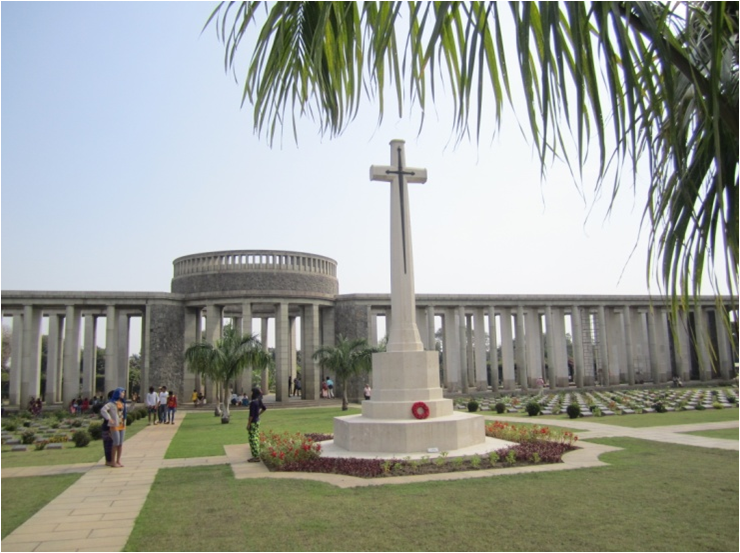 Tragically, as with so many other soldiers from the Burma campaign, Rifleman Maung Tun has no known grave, indeed, no man by his name is even acknowledged by the CWGC in their records or appears with an inscription upon the Rangoon Memorial. With that in mind, I would like to re-dedicate this page to his memory and thank him one final time for his efforts in 1943. 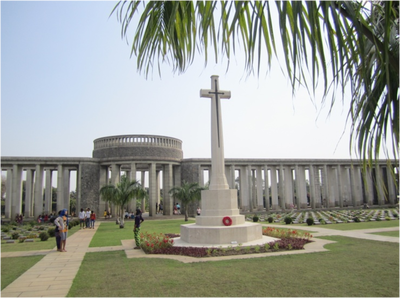 Seen below are some more images which help to illustrate this article, including a photograph of the Cross of Sacrifice at Taukkyan War Cemetery, which I include as a tribute to Maung Tun in lieu of any personalised memorial. Please click on any image to bring it forward on the page. Copyright © Steve Fogden, June 2015.